San Francisco is bold and beguiling, bright and bawdy, and one of the most tolerant cities in the United States. San Francisco is also one of the most beautiful and intriguing cities in the world - 49 square miles of spectacular views and grand architecture, history and culture, old-world grace and hip sophistication. For the sake of organization, San Francisco real estate is divided into districts, each determined by geographic boundaries and each full of distinct neighborhoods. From the ethnically diverse Richmond and Sunset districts to the hip and vibrant Marina and North Beach areas, neighborhoods define lifestyles, and there is a place for everyone and every mindset in San Francisco. 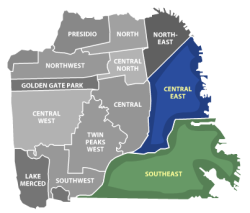 Districts 1, 2, and 3 (Northwest, Central West and Southwest, respectively) are the westernmost lands in San Francisco, and were among the last to be developed. The family-friendly neighborhoods are convenient, with lots of mom & pop shops and nearby eateries. Most homes in the area were built between the early and mid-1900s and include some fine mid-century homes by Henry Doelger and charming row houses by Oliver Rousseau. 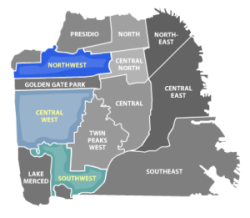 To learn more about the districts, individual neighborhoods, and real estate on the "westside" of San Francisco, be sure to visit San Francisco District 1, District 2 and District 3. The geographic center of San Francisco is Twin Peaks. 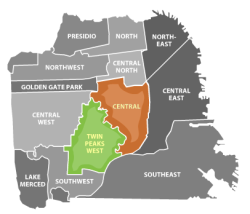 Just west of Twin Peaks is District 4 (Twin Peaks West), a lovely community of peaceful, upscale neighborhoods, full of homes designed by notable architects - including a mid-century modern Eichler development in Diamond Heights. East of Twin Peaks is the exciting, vibrant District 5 (Central), home to Haight-Ashbury, the Castro District, and Mission Dolores. The divergent neighborhoods in this District offer a variety of housing opportunities, including Victorians and Edwardians as well as some stunning contemporary homes in the Glen Park and Noe Valley areas. Explore the Central Districts of San Francisco, including District 4 & District 5. San Francisco's northern districts, Districts 6,7, and 8 (Central North, North, and Northeast, respectively), contain some of the most desirable real estate in the city, as well as some of the most invigorating. Districts 6-8 include the neighborhoods of Pacific Heights, the Marina, Russian Hill, North Beach, and Downtown San Francisco. The atmosphere in these communities ranges from old-school / old-money to edgy and vibrant, and the homes echo this, ranging from gracious mansions to trendy lofts and condos. 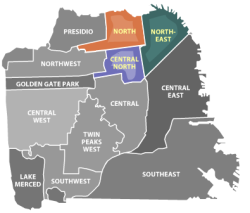 Find out more about the neighborhoods and homes which help define the Northern Districts of San Francisco, which include District 6, District 7, and District 8. Neighborhoods in Districts 9 (Central East) and District 10 (Southeast) have been carved out of the industrial areas of San Francisco, and here is where some of the most affordable homes in the city can be found. Queen Anne cottages, Victorian bungalows, and simple single-family homes predominate in Districts 9 & 10, although some magnificent San Francisco loft housing can be found in Mission Bay and renovated warehouse spaces in the South of Market (SoMa) area. Explore District 9 & District 10, which define the "eastside" of San Francisco. If you like Modernist real estate, be sure to check out the pages on our website dedicated to San Francisco mid-century modern homes, Eichler homes, and Lofts for sale in San Francisco. Real estate is precious in this city. Every hill has a story to tell and a vista to share. Every neighborhood has a spirit and essence to impart. San Francisco is the grande dame of the west, a city of eclectic sophistication and charm, a rough and tumble past, and a vision to the future. Please contact us if we can assist you with your real estate needs in San Francisco!